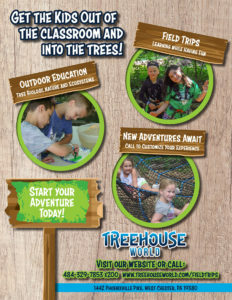 School field trips at Treehouse World are educational, fun, and easily accessible to Chester County, Delaware, and Main Line School systems. Schools can use Treehouse World to reinforce classroom learning in creative and engaging ways. We are eager to design and deliver programs that apply educational topics to real world situations. “I’m never going to use this” is an attitude that we can help to overcome through fun. And, of course, Treehouse Building! We’re happy to design programs on other topics as needed. Most educational topics can be adjusted to work with various age groups – we have had successful tree biology classes with 4 year olds – we just find ways to engage kids and get them to look around them and draw connections between the things they see in the environment. The more they can look inside of and touch, the better. 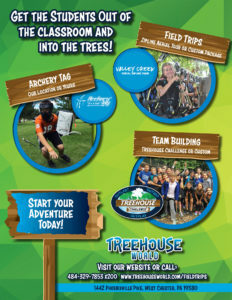 Tell us what you are trying to achieve with your field trip, and we’ll bend over backward to help! We are happy to offer discounts off regular prices for schools and other non-profits with educational objectives. Let’s talk about what you are trying to achieve and how many people are attending. For more information about our discounted group pricing, click button below.